"Maria, these walls were not meant to shut out problems. You have to face them. You have to live the life you were born to live." On Larry King Live this evening (as I started writing this), guest Andy Williams talked about his career. In under 30 minutes there were 2 clips that referenced The Sound of Music. Half an hour later on N.Y.P.D. Blue, Sipowicz refers to a female suspect as a regular "Julie Andrews." I find it difficult to objectively review such a beloved and popular film. I have loved it as long as I can remember, for its happy naïve charm, multi-tiered love stories, stunning alpine vistas and its benevolent and lovely music. The screenplay is based on the Broadway production based on the autobiographical book written by the real Maria Von Trapp. Although more myth than history, it tells the tale of a spirited Austrian girl who aspires to become a nun to be close to the music she loves. Not the best reason to pledge oneself to the Service, her Mother Abbess (Wood) sends Maria (Andrews) out to experience the world by arranging a position as governess for the seven children of a widowed war hero. Maria sullenly obeys, but once there, she brings joy and music back into their lives, wins them over and eventually, too, the heart of the decorated Captain Von Trapp (Plummer)—all as the nazi party comes to rise and "annexes" their beloved country. 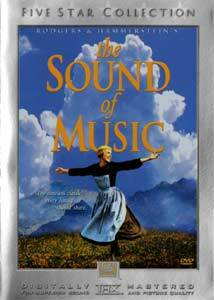 The Sound of Music is a light and lovely story, but it also demonstrates the power of conviction—Maria must be who and what she is, even at the expense of her dreams; the Captain takes his dangerous stand against the conquerors of the country he has risked his life for, and in the end, loses all his gains to take his family to "a better life." It is not a religious story—even though one of the main sets is a nunnery where the sisters sing breathtaking hymns—but one of fate and faith. The songs, as I said, are indelible (I have had that darn goatherd ditty in my head for a week now...!). In the copious commentaries and interviews included, there is a lot of defense around the "filler" songs (composed specifically for the film), but there's no question they are the weakest of the lot. Overall, it is the songs more than the scenes that we remember, and some still rank as the most familiar tunes ever written. Casting here is a director's dream. The fresh-faced Andrews glows from beginning to end. Christopher Plummer transitions the Captain from hard to soft in a most believable way. Although he recorded his own tracks, he was eventually over-dubbed (as was Peggy Wood on Climb Ev'ry Mountain) but I would never have guessed this (Chris, are you sure? Even that final Edelweiss...?). Anna Lee (best known as the matriarch of General Hospital) was originally asked to play the Baroness Schraeder (Eleanor Parker), but opted for the smaller role as Sister Margaretta, the "nice" nun; an even smaller role presents Marni Nixon in her onscreen debut. The Sound of Music is great family entertainment, a beautifully lensed story of a family that literally played to stay together. Featured through the years as a broadcast event similar to The Wizard of Oz, I would doubt anyone could say they have not seen this Rogers & Hammerstein classic and, including those who sneer at its schmaltz, know the words or can hum its most popular songs. It is an icon of American Cinema, and was the highest-grossing film of all time until the advent of the "blockbuster", beginning with Jaws a decade later. Image Transfer Review: Overall, the best transfer available to date, with apparent but incomplete correction. There is quite a bit of graininess in the spectacular opening vistas, most apparent when we fly through the clouds and haze high above the Alps. As we zoom toward Maria, the picture sharpens beautifully. (Andrews tells a very funny story about that shot: the quick but obvious edit between the zoom and her first note was necessary because the downdraft created by the helicopter knocked her down every time!) The outdoor scenes seem better rendered than the indoor scenes in terms of color mix, but the fleshtones lean too close to red. There are occasions where fleshtones appear normal, especially outdoors, but the Captain looks red throughout. Some detail is lost due to scan lines, grain and a softness edging on blur (not to be confused with shots purposefully softened using cheesecloth, as on the Mother Abbess before she sings Climb Ev'ry Mountain). Early in the film the color temperature fluctuates between a whitish-gray and a pinkish hue, mostly in the interior of the villa—it seems this should have been corrected, unless the source could not have been cleaned for some reason. A nice transfer that just doesn't stand out in comparison to what we've come to expect of Fox's excellent work of late, and some transfers made from other films of this period. Nice, just not stunning. Audio Transfer Review: Most of this robust score fills the entire soundstage, that is, the orchestration. With all the fabulous harmonies abounding, it is disappointing to not have them split off—vocals are confined to the front. The exceptions noted are in the choral pieces where the vocals fill-in from the rear. The dialogue is at times directional, but again limited to the front; very even and clean throughout. Not a dynamic workout, but thoroughly enjoyable. Extras Review: The first disc includes the full-length commentary by director Robert Wise, with the soundtrack filling in the spaces. He has a great love for this project and some fun and interesting stories to tell. The soundtrack is instrumental only, which should have just been an isolated music track. There are 61 chapter stops to celebrate in a very well-designed menu format. Subtitles and captions appear below the image. Teasers, TV spots and trailers range from the original preview in 1964 through anniversary trailers to reissue spots from 1973. Various broadcast promos and interviews are also included in this submenu. Gallery contains a text-driven history of the region around Salzburg with the last section (Modern History) a very difficult read against its background (who designs this stuff?). DVD-ROM features claim to include games, wallpaper and access to the official website. However, this fun stuff is NOT available to this reviewer: "Macintosh caveat emptor!" This musical story of the famous von Trapp Family Singers is classic Sunday entertainment for your entire family. From the title song to the sing-a-long fun of Do Re Mi, The Sound of Music provides superlative entertainment value—take a break from Poke-mania and even the world of Disney to share this enchanting movie over and over again. Highly recommended.